What is the replacement cost of a roof? …. And most people thinking of replacing their old roofs with a colorbond or tile roof have no idea of the ‘ballpark’ cost. So, they keep putting it off because they cannot budget for it. Colorbond Vs tile roofs – which is better? It is a bit like choosing between the Liberal or the Labour party. You have two camps pushing their own agenda and a bit of ‘fake news’ clouding the real issues between the two major roofing materials. We replace a lot of tile roofs with colorbond roofs – as well as replacing old metal roofs new colorbond roofs. Why does a roof need to be replaced? When your roof is getting old or it has premature ageing problems, it is time to replace it. The second reason(s) is a bit more complicated. Besides a rusty roof, tile roofs of any age may need replacement. For more details, see my roof repair/replacement post. … Even new roofs can turn out to be ‘Lemons’. And these ‘lemon’ roofs will need to be replaced for long term durability. The relative costs of roofing materials. If you want a replacement slate roof, it will cost you. Slate is the most expensive roofing material and its associated labour costs is on the high end. Roof tiles are generally more expensive per square metre than colorbond metal. The end relative cost will depend on the labour component. Generally, colorbond and tiles work out about the same completed cost for a simple pitched roof. Why do you need a proper quotation? The replacement costs of roofs in Sydney can vary a lot. The nature of the roof replacement. The demand/supply equation. The quality of the completed work and the warranty offered. The quality of the roofers…. And sometimes, there are some strange reasons why roofers make mistakes in quoting for work. The reason that I have to come out to inspect your roof is that I have to do detailed measurements of the roof components, assess the site conditions and look out for any special conditions. Then all these go into my computerised estimating program and out pops the quotation for your roof replacement. You should get a few quotes to give you some comfort before you make that big decision about who is going to do that roof replacement for you. What about a ‘ballpark’ – before I go getting proper quotes? If it is a pitched roof to get the effective area. The range of prices to replace your roof is: $100 to $130 per square metre (ex GST). This will include removal of the existing roof materials and disposal, replacement with colorbond metal or roof tiles (including building blanket, battens, sarking etc as applicable), and final tidy up. Steep roofs, difficult site access, smaller roofs, asbestos cement roofs and remote sites will be at the high end of the range. Simple roofs with single or double pitches, easy access and average sized roofs will be at the lower end of the scale. Concrete tiled roofs are generally the cheapest, followed by terracotta then colorbond roofs. (bear in mind that the video is a few years old (January 13, 2012) and costs are about 30% more today). I have a patio on my rooftop i would like to cover in with either colorbond or similar. Its around 20m2 in area, posts & rafter is already constructed as an open roofed patio. Id like a quotation for installation inc labour & GST. Send me an email when you can, I live in the eastern suburbs. Thanks for your roofing enquiry Chris. I will email you for details. 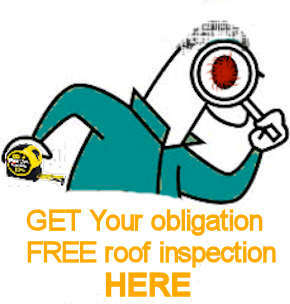 If your roof is in Sydney and close to Strathfield, hit the contact link and send me your details. I will do a quote for you. I live in Lidcombe and doing a complete renovation and got the roof (which is very old) restoration . While doing this i found some of the sheets are rotten and has broken. I am planning to replace it with a new one. will you be able to give a quote for this? My address is 32, woodburn Road, Berala. Forgot to give me number: 0439430094. I will give you a call about your colorbond roof replacement in Lidcombe. I liked your video, I have a very rusty Klip Lock garage roof that i would like replaced and would like to get a price. Thanks for your enquiry Mike. I need a quote to fix several roof leaks and repointing or rebedding of ridge caps. Can you advise when you will be around the eastwood/carlingford area for a quote on the weekend? I live in Dundas Valley and my mob is 0413636769. Pls call my wife, Amber (mob 0430498685) to arrange the inspection if you can only come during weekdays (preferably around 4pm) . I am looking at inspecting a house for sale at 333 springvale rd donvale which from the aerial view has an asbestos roof.I am unsure what costs to factor in to removing and replacing the roof does the $110 psq mtr include asbestos removal? Because we only do asbestos roof replacements in the western areas of Sydney, I have no real data on asbestos replacement costs in Victoria. I have been doing house hunting recently, found a house that I really like but have flat roof. I have heard so many disadvantages of flat roof, just wondering how much it would cost to convert a flat roof to pitched roof. Flat metal roofs down to 1 degree pitch are quite OK. It is not that flat roofs have many disadvantages – it is just that a lot of people doing flat roofs go about it without any regard to quite basic roofing rules. You can get away with over sights and short cuts when the roof is steep – but a flat roof needs more installation care. There are hundreds of thousands of flat roofs in Sydney giving very good and reliable service – just because they were done right. A conversion of a flat roof to a pitched roof is not a simple exercise. It is a structural modification, so it will involve engineering and a development application. The roof work on a new house can be about 20 to 30% of the total house cost. And building a house in Sydney is around $1500 per square metre. Since you have to demolish the old roof, allow for weather protection during the building work, special design and approvals and renovation construction costs (rather that straight forward new building work), the actual rate to convert a pitched roof to a flat roof may be about $800 per square metre. For a small 150 square metre house, the cost to convert a flat roof to a pitched roof is about $120,000. It is a lot of money. Hi Jack, we have recently purchased a single storey house with a terracotta tiled roof. In the building report we were advised that the roof tiles are exhibiting wear and tear and require restoration to prolong their life and prevent rain water penetration. It recommended cleaning and sealing the tiles to keep costs down as replacing it would cost around $15,000. Does the cost estimate found fair? The house area wherein roof replacement would be required is approcately 190sqm. How would a “cleaning and sealing” Restoration compare in terms of pricing? Cleaning and sealing of terracotta roof tiles DOES NOT prolong their life. It is a myth. The process is purely cosmetic. You are better off just repairing it if there are roof leaks – or just replacing it if you want a new roof. Any money – let alone $15,000, is a waste for trying to prolong the life of terracotta roof tiles. Can you please advise how the roof with asbestos looks like. Is there any directions or some photos that I can have a look? Just been flat out with roof repairs and colorbond roof replacements leading up to the Christmas season. I just wanted to know if it’s going to cost alot to replace parts of the roof truss as we found out that the house has chared truss. YEs, I know I should not have bought it. Sorry for the delay. We have been on Christmas holidays. I am afraid that I do not have very much experience with replacing roof trusses – so a cost estimate will be difficult. I suggest finding a good carpenter (and I do not think it is going to be that expensive to do). I need two flattish metal roofs to be renewed. One is a Stramit roof, about 45 years old which is going rusty. It measures about 6m X 9m. This has a celing made of Stramit bats of straw wrapped in paper, so they cannot be allowed to get wet whilst the roof is being replaced. The other is the Stramit roof of a carport, measuring about 5.5 X 5.5 m, about 30 to 40 years old. Can you please give me a very approximate estimate of what the cost will be for these replacements. I would imagine that the Stramit roof over a room would also need facia and guttering replaced as required. The carport roof is simply constructed of 3 beams with the roofing sheets attached. There is no facia or guttering although we could discuss adding these if necessary. I live in Castle Hill. Sorry for the delay. We have been on Christmas holidays. A very approximate cost for replacing the roofs with colorbond, including associated work is $10,000. What should I be budgeting for for an entire roof replacement – new trusses, joists etc & terracotta roof incl. sarking, battens and the like. I have the mother of all renos to do – approx. 250m2 roof – old 1900’s house on lower north shore, Sydney. Sorry, I am a bit useless when it comes to roof framing stuff – because we do not do it. The work will require a builder to co-ordinate, so he will be your best bet. I stumbled onto your website when looking for roof replacement costs on Google. Our house has a (concrete?) tiled roof which looks pretty worn out. Does roof painting really help or is that a waste of money? Appreciate your opinion. I am rather inclined to replace it with a brand new colorbond roof once I have saved enough money. Personally, I would not paint my roof. Concrete roof tiles are painted in the factory and the paint coating deteriorates over time. The tiles still work without the cosmetic paint coating and they do not get any weaker or become more porous. So, I think that painting is just a cosmetic thing. A new roof later down the track is a better option. I am looking at renovating in Lane Cove. I am looking at a new roof tieing into the old with a total area of 121m2. I want it tiled to match the existing. It is a single storey addition. Can you give me a budget estimate please. Since we do not do tile roofs (we specialise in colorbond metal roofs), my cost estimate is based on limited personal experience. I am not sure of the complexity of the new roof extension – but a new tile roof on a typical new roof extension should be around the $100 to $110 per square metre. The cost is only for the tiles or colorbond metal. The roof construction work (trusses, etc) is part of the builder’s cost. May I please ask which is cheaper to do compare hip roof and flat roof. A hip roof is steeper and there are more measurements and cuts and flashings. It is about 30% more expensive than a flat metal roof. I’m in Wetherill Park, South Western Sydney and I am getting some lichen on my terracotta roof tiles. Total roof area is around 300m2. Double story with upper and lower roof sections with 30 degree pitch on upper roof. House is 12 year old. Tiles need a good clean, and clear gloss sealer and check pointings. What price do you expect it should cost me. Sorry, I do not do cleaning and painting of roofs. So I do have no proper cost estimates to give you. We’re looking at buying a house with a skillion roof that’s rusting. The building report says this will need to be replaced (along with alot of other parts f the house!). Was wondering if you could give me a ballpark on roughly how much it might be. The area is approx 8x6m and is corrugated metal, pretty much flat. What’s your recommendation please? Thanks and look forward to your email. Thanks for your enquiry about the rusted skillion metal roof. I recommend replacing the corrugated roof with a colorbond ‘kliplok’ profile roof and at about 50 square metres, you should be planning for between $5000 and $6000. Your request sounds like it needs a site inspection to get a proper estimated done. Hi, we have solar panels on our roof. Can you uninstall the panels and reinstall after replacing the roof? Solar panel removal and installation has to be done by licensed electricians. We are not able to do this work. How far west do you go? I’m in the Blue Mountains 30minutes west of Penrith. My existing corrugated iron roof needs replacing along with battens. Would you quote? The roof area is about 11x 14m. Penrith is about the limit of our coverage to the west – so I am of little use to you for roof work in the Blue Mountains. The house I have recently bought has a flat (or near flat, not entirely sure) roof. I would like it renovated before moving in and want to have an idea of the costs I may run into doing this. So here is what I want to know from you – 1) how much would it require to get a new flat roof and 2) if it becomes too expensive, how much does it cost to fix/repair the existing one? I understand that without looking at the roof, it would be difficult to give me an accurate estimate, but I would appreciate a ball park figure if possible. You are right. Very difficult to put a price on something without any measurements or location. However, you can work out a ball park figure yourself by using the rates on this page and elsewhere on my website….. I have a duplex which is ground floor plus a habitable roof, meaning the first floor has tapering ceiling on the sides. I want to raise the floor to full height. That will require raising side walls,windows and putting a new roof. The existing is a 45 degree angle roof with concrete tiles. Can you advise how best this job can be done with minimum cost and turn around time. also, can the first floor be protected from rain during this roof replacement job? You ask some tough questions! I am biased towards metal roofs and my suggestion is a low pitched metal kliplok roof to replace the steep concrete tile roof. But check what it will look like as a finished product. Metal roofs are lighter and demands less structural work. The builder can tarp the roof during the construction process. Bubble wrap type insulation (like Aircell glareshield) has quite high R value (approx. 2.4). The equivalent building blanket is 100mm thick with a R rating of 2.5. The problem with thick building blankets is that it gets compressed by the roof sheeting and this automatically reduces the R rating. It is worst where it passes over the battens (where maximum compression occurs). Systems like roofrazor are used to limit the compression at the battens/purlins and generally under the rest of the roof sheeting. Hey Jack, great site. Just thinking of replacing our single level concrete tiled roof with colourbond, and wondering if there are any special considerations for installation being a steel frame house? Also, is any additional anchoring of the roof framework required when swapping tiles for sheeting? We’re in the Hills/ Kellyville area which is not an overly windy location but are there any regulations that we need to think about? Thanks, Murray. There are no additional structural modifications required if you are replacing a concrete tiled roof with a metal roof. You do however have to install new wider steel battens to carry the metal sheeting (more for an attachment point for the screws). Thank you for providing such a great website and service Jack. Your website is very helpful. We are in the ACT, can you by any chance recommend someone to replace a tiled roof with a metal roof in Canberra? Since we are only a small roofing business based in the western suburbs of Sydney, we have not got any reliable roofing companies in the ACT that we have experiences with. You will have to do a bit of ‘checking out” as you go through the local ACT roofers.. I emailed a request for a price indication some weeks ago and received no reply. May I ask again. I am the secretary for a block of 12 apartments (Strata 269) in Ashfield. We want to replace the AC roofing on an external laundry block and a garage block. Both are low pitched skillion roofs and we wish to replace with a colobond material. The laundry section is approx 11m2 and the garage 84m2. Could you provide us with a price estimate that includes everything. Can you submit your request through the form on the “Contact” page again and I will take a look for you. Hi, I have a roof approximately 70sqm (including the 1.1 multiple.). It is part slate roof and half old corrugated iron. Could I get a quote from you please? We would like the roof done asap. I have been thinking about repainting our colorbiond metal roof. It is quite a steep pitch and three roof painters have said it is too steep for them. The roof is in good condition but around 20 years old so am now considering replacing the roof. It is around 200square metres. We live in the Newcastle area and just wondering what the approx. cost to replace rhe roof may be. Steep roofs are quite expensive to replace. I am not sure about rates for Newcastle work. For Sydney, you may be looking at $50,000. I’m thinking of replacing my old tiled roof with a Colourbond roof but not sure if it would suit the style of house (house is an old 70s Spanish looking house). Do you know of any sites that allow you to upload a photo of your house and overlay it with a Colourbond roof so that you can see what it would look like? Also if going from a tile to Colourbond roof, what is done given that the Colourbond is a lot lighter than tiles. I’ve read that in some cases tiled roofs cant be converted to Colourbond as the roof structure is built differently? Generally, tiled roofs are loaded a lot more that metal roofs. Where the roofs are designed for cyclones, a metal roof will have less ‘dead weight’ against uplift forces. So, the roof trusses or rafters need additional tie down straps to counter the uplift forces. If you are in Sydney, there are no cyclones. So, uplift forces are not usually a problem and no structural modifications to the roof structure is required if you change from tiled to colorbond metal. Your video is a good guide. I have a rectangular skillion roof approx. 210m2. I would say it is only 2° max. There is a large portion of surface rust and I have found some localised areas it is rusting virtually right through. I also have 12 panels of solar panelling. what would an indicative price here be, and how would I need to deal with the solar panels. You will be looking at a price range from $20k to $25k for a full roof replacement. My house has a 6.7 x 3.4 family room which the precious owners converted from a patio area. It has a flat tin roof. I am looking at converting it to a tiled pitched roof to match the rest of the house. What is a rough cost? A tiled pitched roof will need council permission and will involve a builder. We do not do this type of work and my rough cost stab is about $20,000. Hi Jack. I live in a strata complex. We have a tiled roof. I’m on the top floor. We are an old art deco building built in 1928. A beautiful old building with all the craftsmanship you would expect from the era. The ceilings are moulded. Unfortunately in the stairwell our ceiling has been destroyed due to cracked tiles. As I’m on the top floor I’ve investigated the roof to ensure this doesn’t occur in mine or any of the other flats. The sarking has numerous holes which I will want to patch up. Will this help prevent any more damage? What is the approx. cost? we have 4x identical 95sqm apartments on that floor. The main thing is to get the cause of the leaks fixed. The sarking does not stop the leaks and it is secondary whether it is repaired or not. It is usually tiles and the capping that cause problems. I am not able to give cost without an inspection. Hi, purchased house where trusses have deflected (build report suggested weight of concrete tiles and settling). Plus roof needing desperate repointing everywhere. Quoted 27k to replace with new gutters and down pipes (as old seem too small) in colourbond on 308m roof. Price sound right but should I just get it repointed for 4k? And will deflection fix itself or will the weight difference affect something else I haven’t considered? Sagging of roof trusses is quite common – due to a variety of reasons. Often the deflections have stabilised and apart from the look… it is OK to leave it as it is. The important thing is to check for any cracking of the trusses or rafters and that the connections are still sound – which will indicate ‘failure’ situations, rather that pure deflection. If it is pure deflection, then repair of the existing tile roof is a viable option. We have a semi with both flat (approx 40sqm – for the extensions on the house) and pitched (approx 70sqm – tiled – the original house) roofing. We would like to replace the entire roof to be the same pitched colourbond roof throughout. Could you give me a guide to what this will cost? The big unknown is the cost to install new timber trusses/frame to turn the flat section into a pitched section. There are many factors involved and I do not have any feel for what this will cost. There is nothing wrong with flat roofs – provided they are roofed correctly. Our 2-storey-plus-attic strata block of 4 flats has a 30 degree slate roof and 4 dormer roofs in the attics, measuring 3.3×2.2m, 2.4×2.2m, 2.4×2.2m, 2.2×1.8m. All dormer roofs are simple skillion with 1 degree pitch. Each dormer has an eaves gutter on 3 sides. The 4th side is flashed under the slates. We need to replace all dormer roofs, flashings and gutters with Colorbond Ultra sheeting and guttering. The dormers face east and are subject to regular strong salty breezes. We are concerned that ribbed profiles such as Kliplok will allow rainwater to be blown into the ends of the ribs. Assuming that the timber structure is okay, what ballpark cost amount should we allow to replace gutters, flashings, roof sheeting, and what type of roof sheeting do you recommend? You are probably looking at around $3000 per dormer. With a 1 degree pitch, you are pretty much stuck with a ‘kliplok’ style profile roof. The Lysaght ‘Longline’ profile can also do 1 degree and has a much smaller hollow at the ribs. It is a bit more expensive (although in the scheme of things, it may only add another couple hundred dollars per dormer). There are weather strips that can be installed in the hollows of the kliplok ribs to prevent wind blown water entry – so the ‘kliplok’ profile will work also. Also, colorbond ultra is the material that you should use. Hi Jack. I really like the information and honesty you have given on this site. Being bitten by shocking dodgy builders in the past I’m very nervous about having more work done. Being that you have put me at ease with your video I was wondering or hoping that you do work in Newcastle. And if not that you might be able to refer me to someone you know as honest and trustworthy. My problem is that turns out my colour bond roof is one of the ‘dodgy batches that the colour faded’ was installed some years ago. Colorbond told me that if I could provide proof of installation it would be replaced by them. I contacted the previous owner who’s response was “It’s not my problem I don’t live there anymore” and she hung up ?? So I would like to get an idea on the cost to replace my faded colorbond roof please. I have considered getting it painted but the paint won’t last long and I’m only delaying the inevitable of having to replace my roof. We do not work in Newcastle and I do not know of any good roofers up there. I see the faded colorbond roofs in Sydney also – although I do not know exactly the reason for the colour fade. Apart from the fade, most of these roofs that I come across do not show signs of the undercoat wearing away and allowing premature exposure of the zincalume coating. So, the problem is mainly a cosmetic one. If you are concerned about the ‘look’ – then I would suggest you re-consider painting.